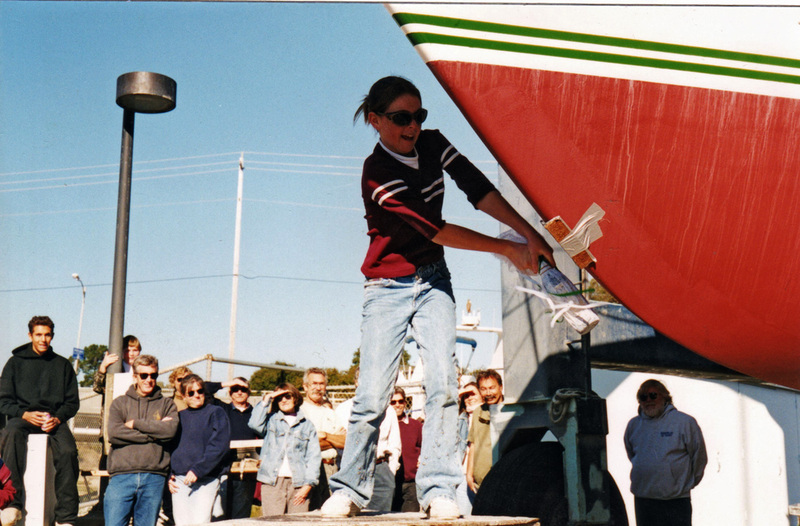 After... and almost ready to launch. 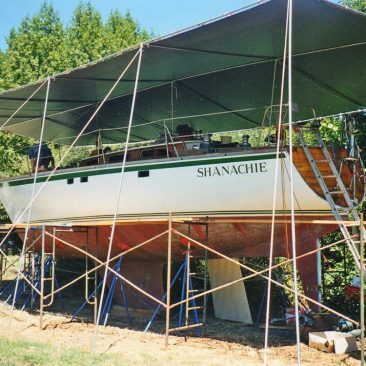 After sailing on Shanachie for many years throughout the Pacific, as far south as New Zealand and as far north as Maurelle Island (off Vancouver Island in B.C., Canada), we thought we were ready for a change. 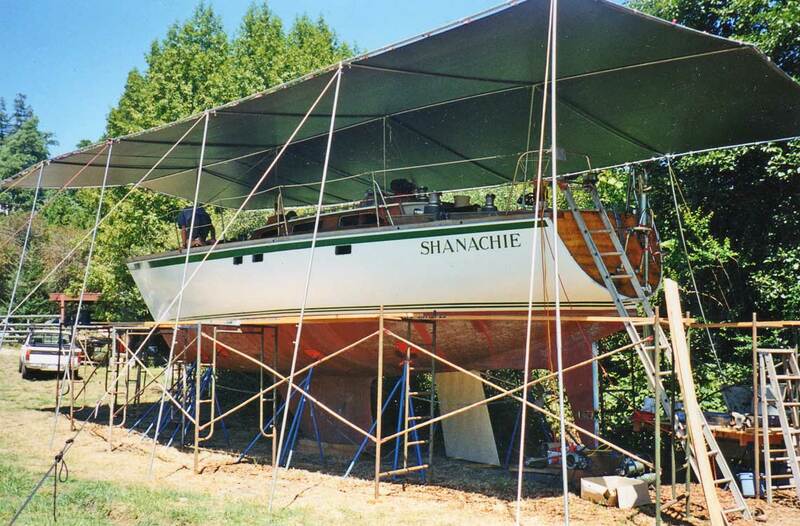 Thus, we started a new business in California, and sold Shanachie in Seattle in 1992. 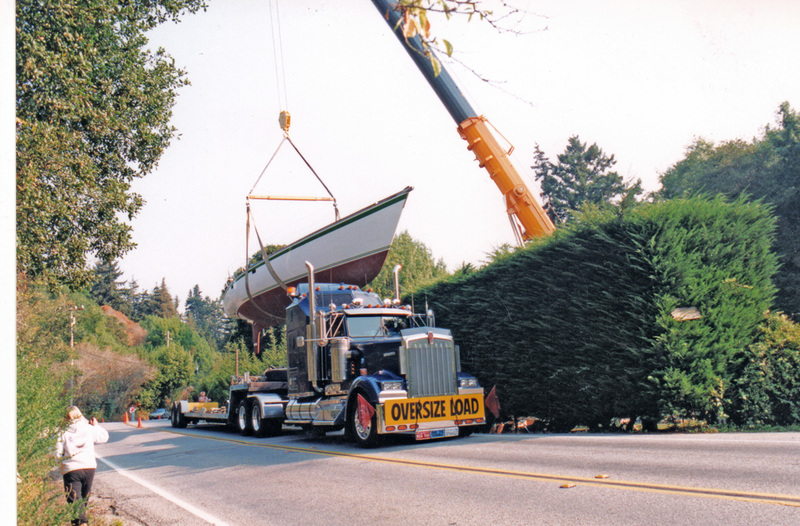 Eventually, the new owner hired a delivery crew to bring the boat from Hawaii to Washington. 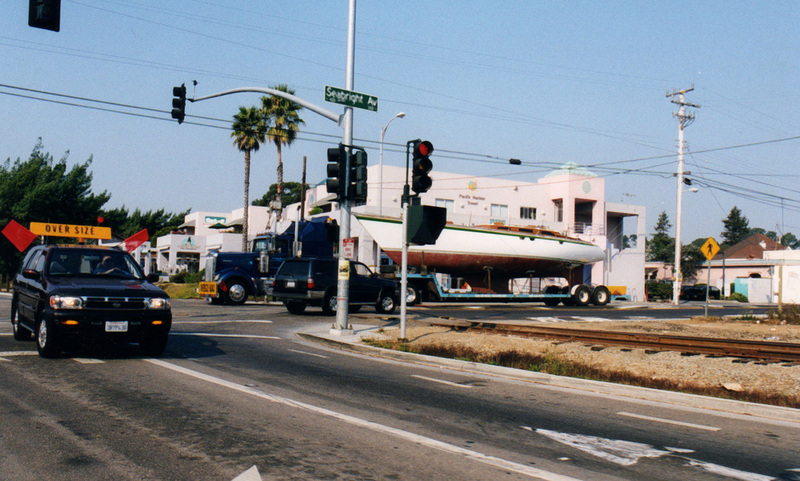 For reasons no one will ever know (because, during yet another boat delivery job soon after this one, the same delivery skipper fell overboard and was lost at sea near San Diego), Shanachie was dismasted mid-Pacific. 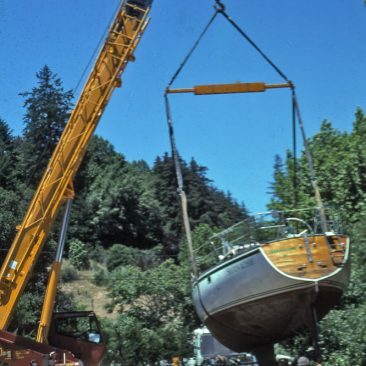 The U.S. Coast Guard rescued that skipper and crew, and then towed Shanachie for 5 days (which is almost unheard of—damaged boats so far offshore are more often simply sunk—Shanachie was a lucky girl!) 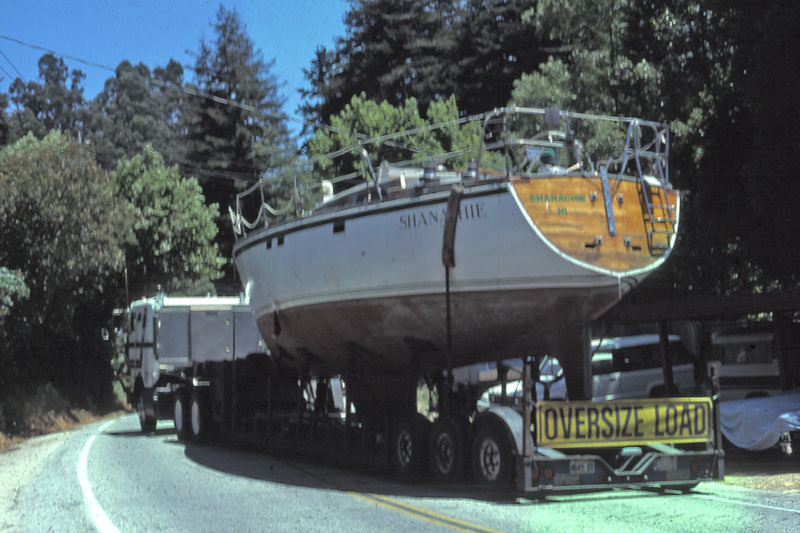 to Port Townsend, Washington, where she remained virtually untouched on the hard for more than a year. 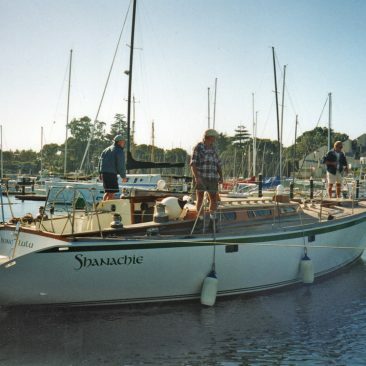 At that point, the owner then offered to sell Shanachie back to us. 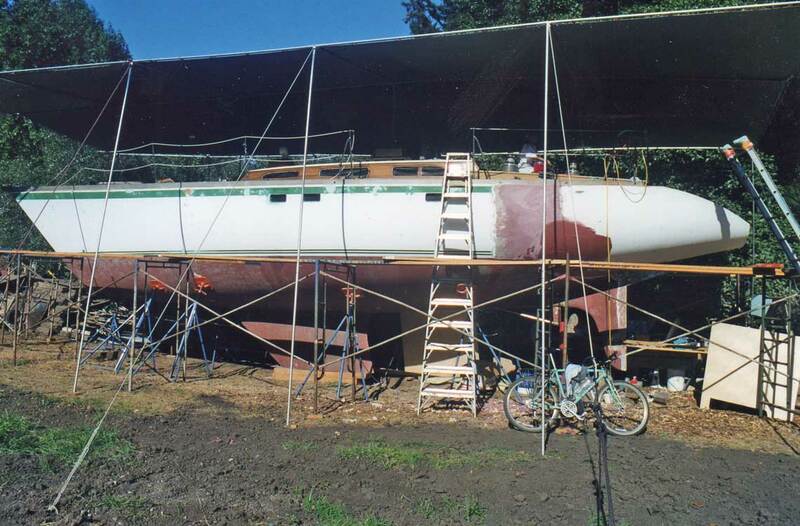 The boat looked worn and neglected though she was still structurally sound and, of course, she needed a new mast. 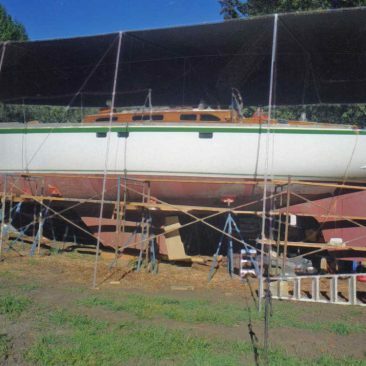 Since Joe had originally built her, we felt he could certainly fix her up again. 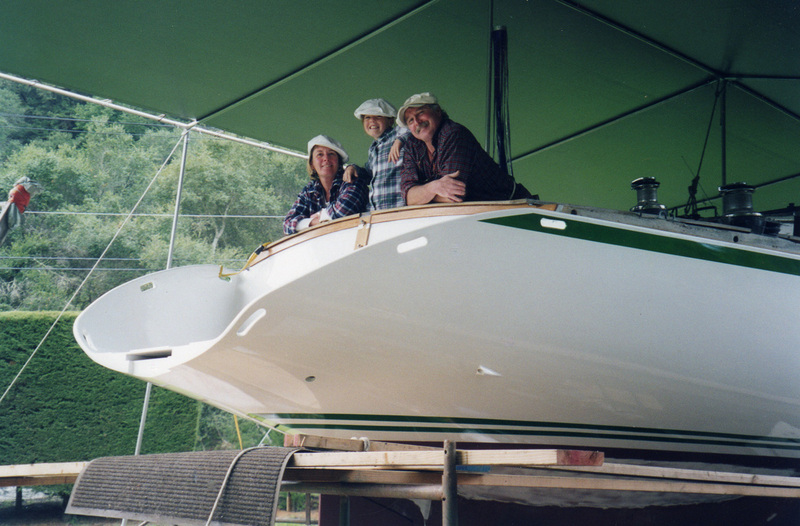 We also realized how much we missed the cruising life. 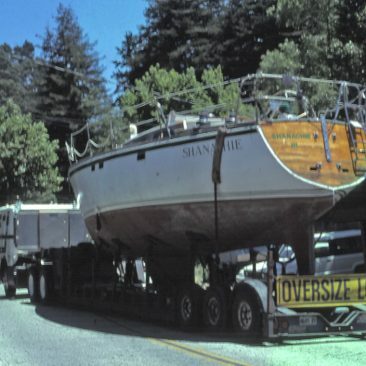 Despite sacrifices we knew were to come, our family decision was to buy Shanachie back, and so she was trucked down to Santa Cruz from Washington in June 1998 to begin yet another era together with us. 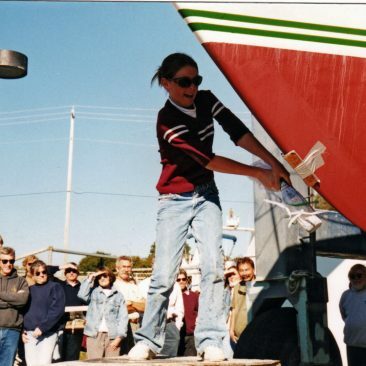 The dream was to eventually sail away again, and introduce our daughter to cruising again (she had been the baby on board from 6 months to 3+ years old), since she was now old enough to appreciate—or rather, remember—it. 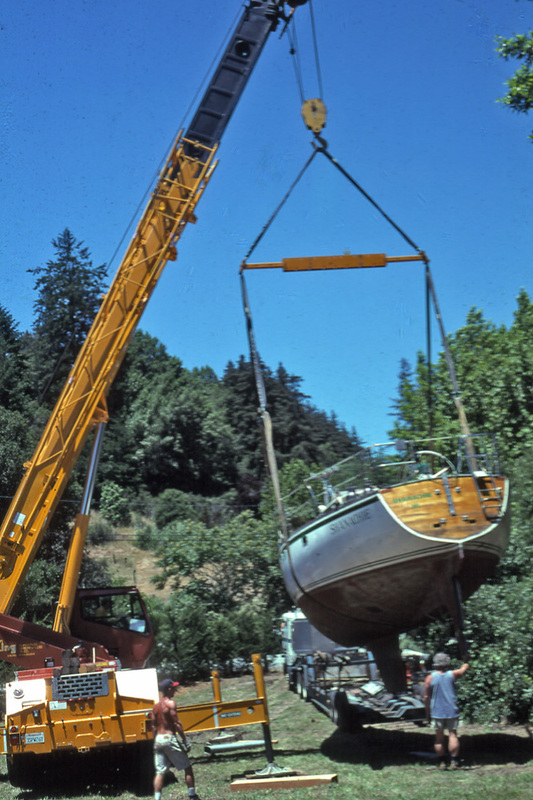 With the nearly 7-ton keel bolted to the hull, it wasn't feasible to bring Shanachie back up our steep driveway to the boatshop, so our friends, the Rippe-Morris family, generously offered the use of their flat property ("You're putting WHAT in our back yard?!"). 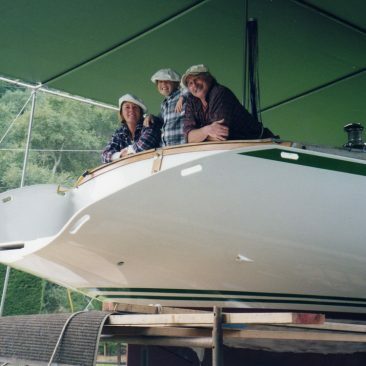 Joe then spent 18 months refurbishing, re-fairing and re-painting the hull, re-wiring and replacing the engine, along with literally thousands of other "re-" jobs. 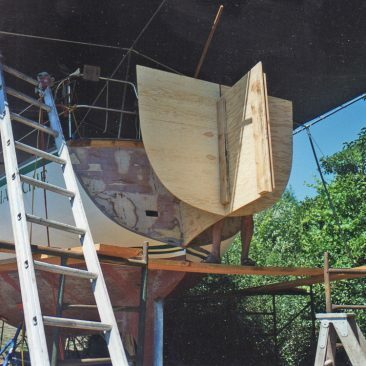 Most importantly, though, was the addition of "the back forty," a luxurious new swim/dive scoop (with built-in hidden stealth ladder) on the stern, which also added about 4 feet to the overall waterline length. 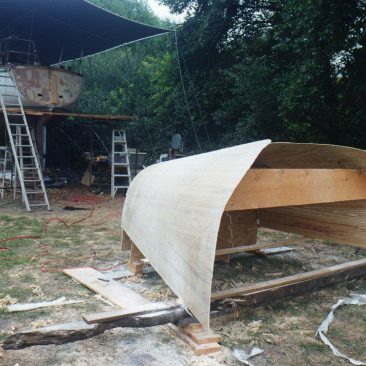 David Blair—Shanachie's original boat builder with Joe—returned from New Zealand (with his family this time), and spent 5 months living in Santa Cruz while masterminding the design and fabrication of the scoop, which was no small task. 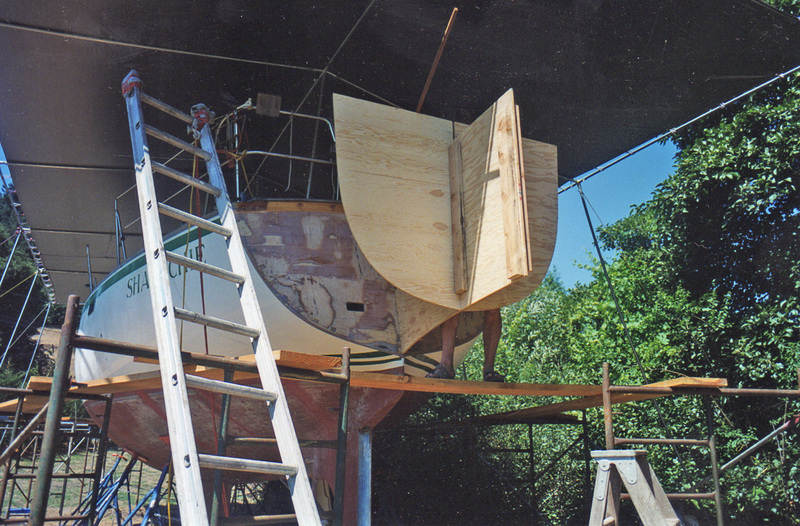 Joe figures this stage was approximately 6,000 man hours before he stopped counting—nearly half the time it originally took to build the entire boat! 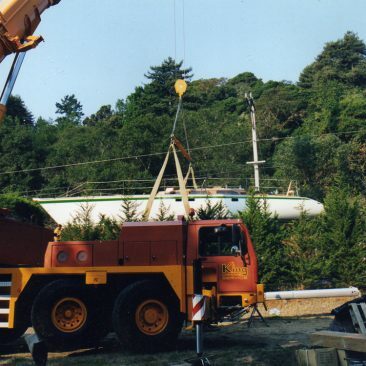 Below is the story in photos. 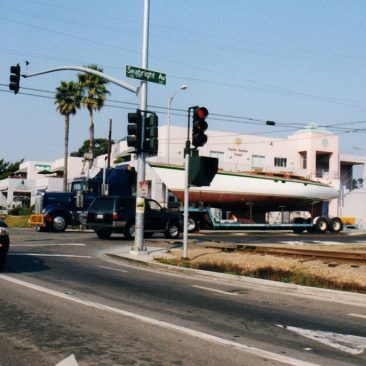 Click/tap or hover on them to view captions. 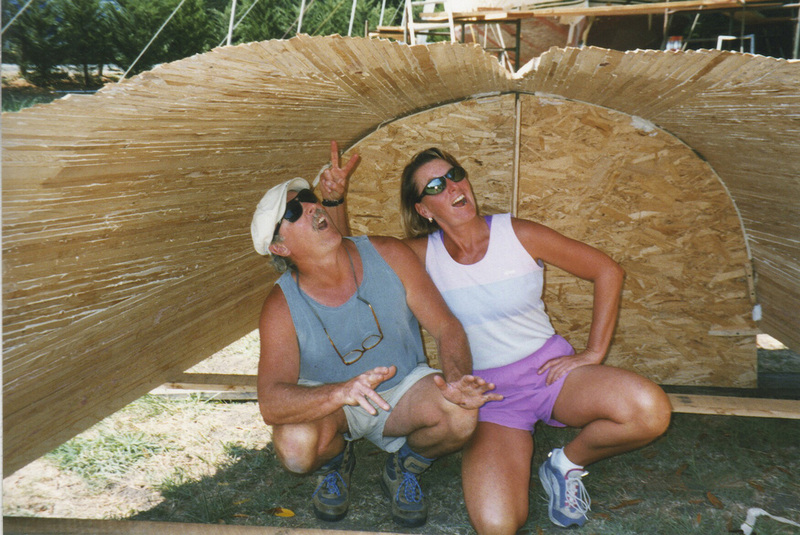 A double-click/tap enlarges them into a slideshow format. 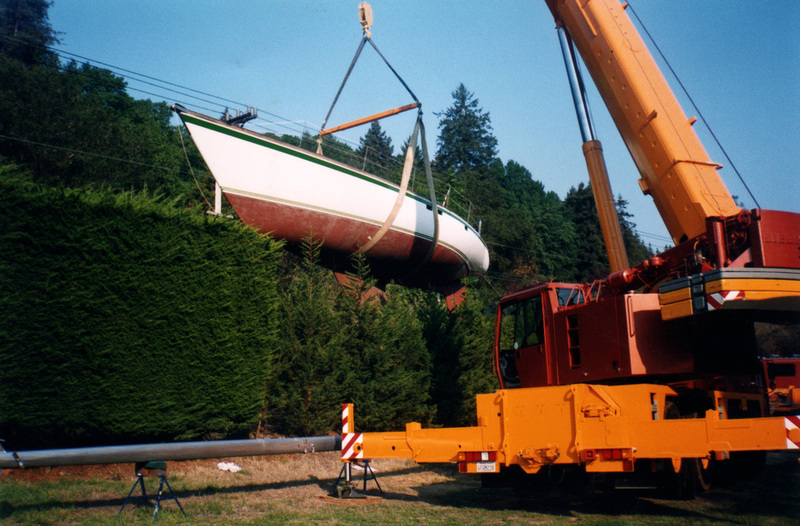 With the help of King Crane, Shanachie settles in at the Rippe-Morris back yard. 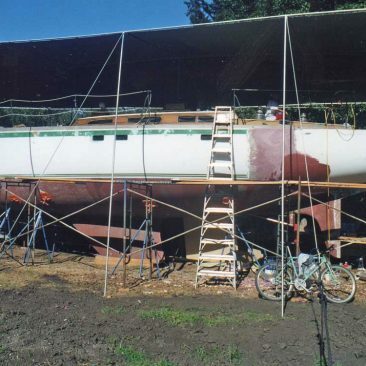 The “shop” is set up, ready to begin work. 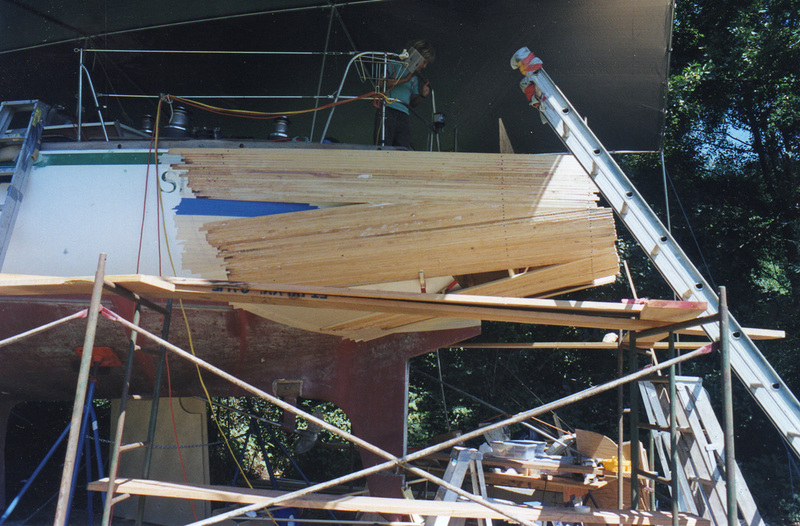 A false station is built off the stern, onto which the temporary mold for the scoop extension will be laminated. 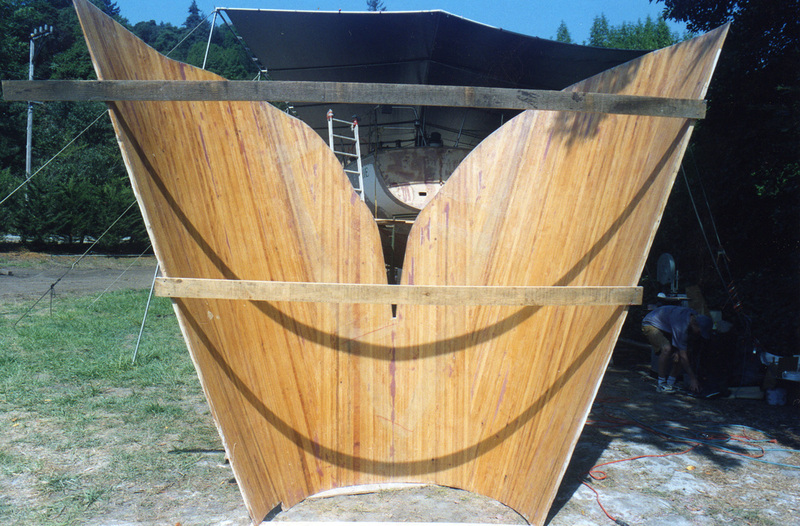 Port Orford cedar laminates are temporarily fastened to the hull to form the correct hull shape once it is extended beyond the original to create the scoop. 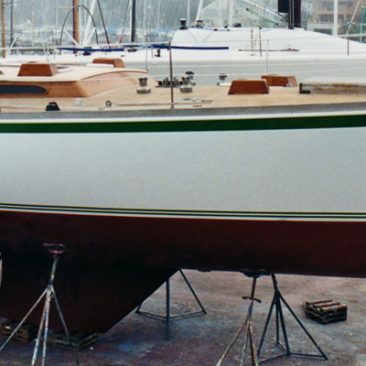 For an aesthetically correct scoop that is true to the original lines of the boat, the existing hull needed to be widened 6″ on each side at the transom area. 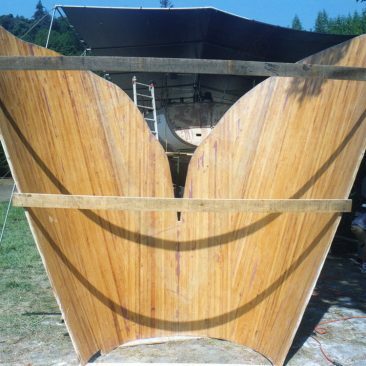 The scoop is attached almost 8 feet forward of the stern along the existing hull lines. 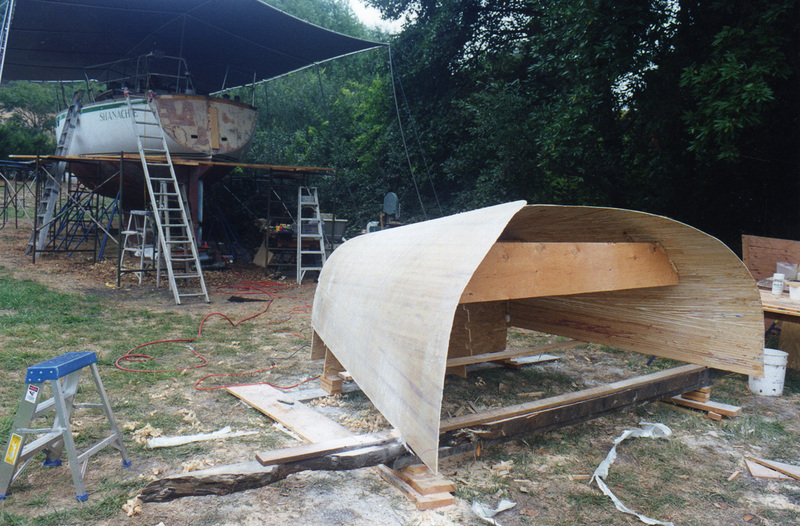 The scoop laminates have been faired, fiberglassed, re-faired, re-faired again, and re-faired yet again. 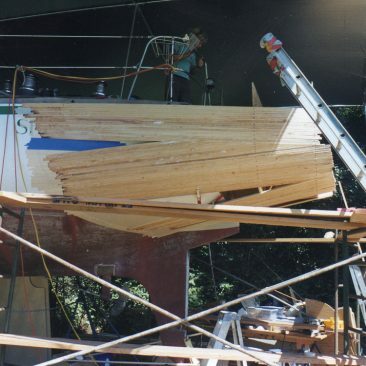 Fairing the scoop onto the hull. 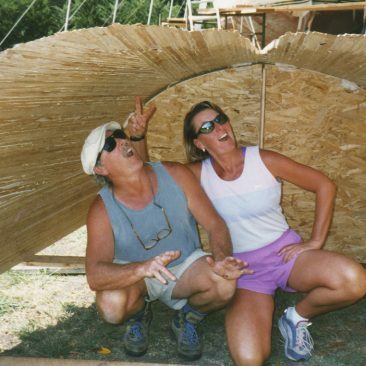 Up and over… During the 18-month scoop project, a new shed had been built where Shanachie first entered the Rippe-Morris back yard, barring an exit the same way she came in. 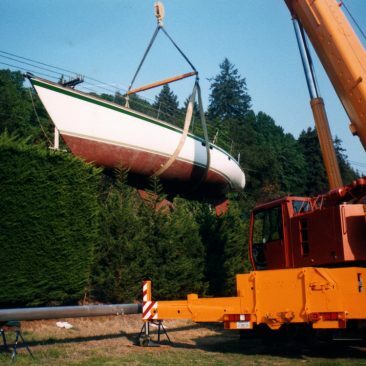 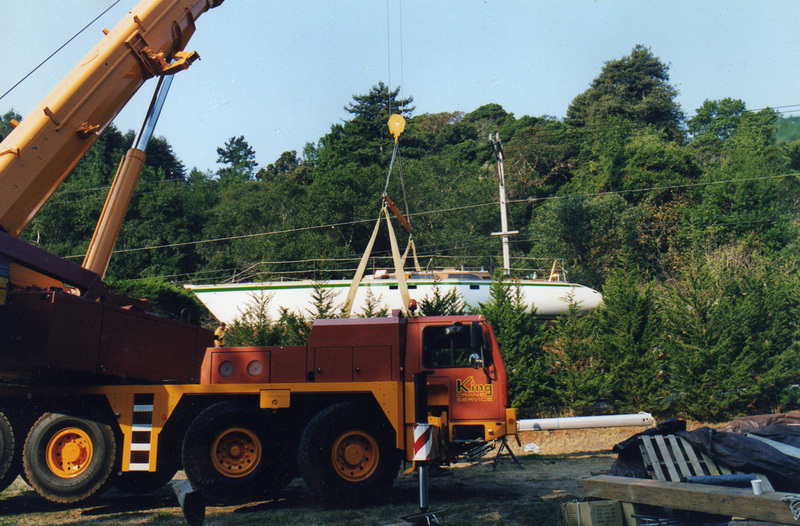 So, King Crane simply lifted Shanachie out of the yard with their 120-ton capacity crane, and over the 15-foot hedge—quite a harrowing sight to behold! 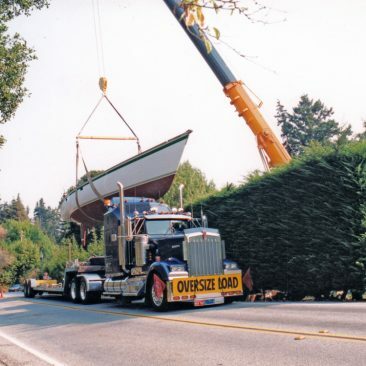 Whew—the lift over the 15-foot hedge is a success! 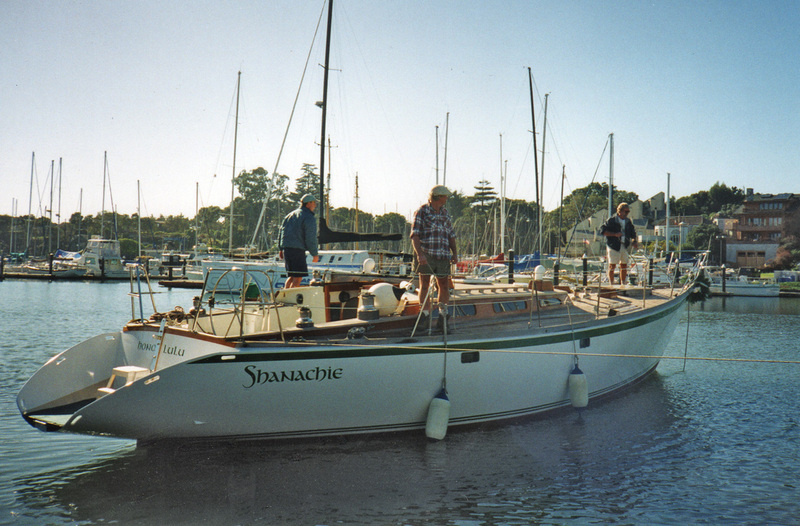 Shanachie is re-launched a little over 18 years later in exactly the same place she was first launched in 1981 at the Santa Cruz Harbor. 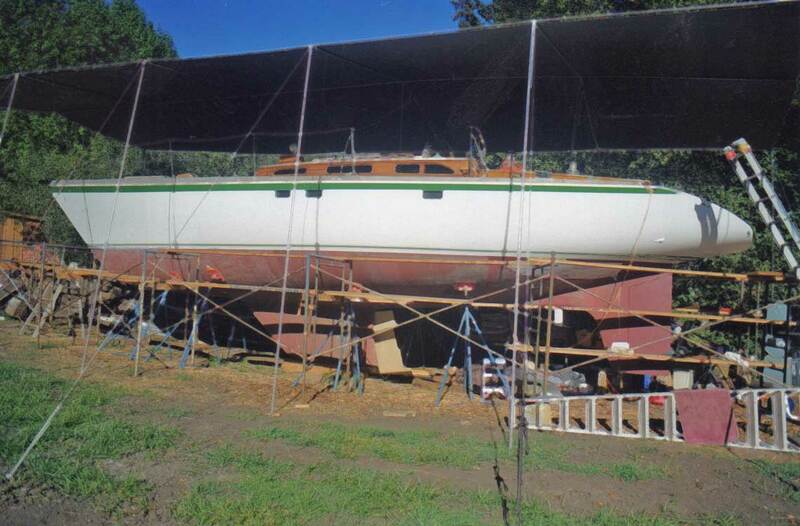 She’s lookin’ darned good for her age, and happy to finally be back in the water.